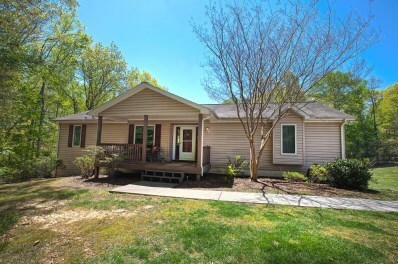 You’ll feel that you have the best of both worlds here, located on an ideal wide cove on beautiful Smith Mountain Lake, yet convenient for all your day to day needs. This custom built, one owner home on over an acre and a half is full of forethought and detail throughout. If you’re hoping for an open, spacious gathering place while cooking and enjoying company, you’ll love that the custom kitchen opens up to a sun room, a large family room with a stone stacked fireplace and dining area…all while enjoying the peaceful and serene view! This home offers three master suites with walk in closets and two with their own private deck. The lower level is ideal for guests; in addition to the two bedrooms, offering office space, storage and another garage/workshop space. A rare opportunity to own a very private waterfront property in Mariners Landing. You’ll feel right at home with the warm, neutral inviting color choices and decor. The granite and stainless kitchen is open to the living area with a stone gas fireplace. The lower level offers a game room and movie room along with an additional bedroom. The dock is private, with an upper party deck perfect for sunbathing or enjoying the view. This is currently an income producing, short term vacation rental property that has an established history and is a favorite- keeping vacationers coming back for more each year as well as a favorite on airbnb, bringing in 28K in 2018 during the rental season. VIEW! LOCATION! LOT! This is the one you’ve been waiting for! Enjoy the beautiful mountain and water view along with the sunrise with your morning coffee in the sun room just off the kitchen. The master bedroom and bathroom are located on the entry level, along with two other bedrooms and another full bath. Downstairs, you’ll appreciate the large family room with wet bar, along with an additional large room, that could easily be turned into another bedroom and hobby room, with storage galore. The gentle lot to the water is park like, with a few shaded trees and an easy walk to the dock with two floaters and a single slip with hoist. This location is awesome, both by water and boat, close to all area amenities, including the community park that offers trails, a park, a sandy beach and more. Opportunity awaits for you to have it all! Learn how to create a step by step plan to downsize, while saving time and money in the process. A tempting buy for the lake lover who’s seeking the part of Smith Mountain Lake that is in calm, shallow, prize winning fishing waters, ideal for both kayaks or canoes. Just minutes from Westlake amenities and deep water by boat. This home will become your ideal family gathering place, with many options for the full or part time resident, giving you space to entertain both inside and out. You chose whether to entertain indoors in the open, spacious kitchen and living area, the screened porch or outdoors on the expansive Trex decking that feels like you own your own personal park and place to escape, the fire pit area or on the dock. Explore the possibilities to care for guests and family with two living areas, five decorated bedrooms, and handicap accessible doorways with all the appointments and finishes that you could hope for including 9 foot ceilings, hardwood floors, granite, stainless steel appliances and ceramic tile. You’ll feel the warmth of a decorators choice in paint colors and decor, which could be purchased if you desired- move right in, hassle free. If you’re looking for a Smith Mountain Lake waterfront home that offers a very gentle slope to the dock with a paver pathway, you’ve found your new home! The beautiful sun room or the two screened porches likely will be some of your favorite spots in the house as you enjoy your view. The essence of a lake house, this home is perfect to move right in. Two bedrooms are offered on the main level, with an additional living room or bedroom downstairs with its own bathroom. The lower level also provides a nice workshop space or additional square footage to make your own. The cove is known as a great fishing spot. Interest Rates Are Going Up – Have You Heard?? It looks like we have a couple of more interest rate hikes on the way, according to the Federal Reserve. This could slow the market for sellers and make it much more difficult for buyers to qualify or cost hundreds more in monthly payments. Now is the time to act, so if anyone has whispered to you that they are thinking of selling in the near future or buying a new home please reach out to me with their contact information. I would appreciate the opportunity to let them know about the outstanding services I provide. Are you looking for a home that offers a Smith Mountain Lake seasonal view, plus a deeded, assigned boat slip with community boat ramp and storage area? Look no further! This spacious home offers over 2 acres of privacy, along with 4 bedrooms, 3 bathrooms and additional living space in the lower level for whatever your needs may be! A concrete pad is already in place, ideal for a workshop or garage. Great investment opportunity here! Aggressively priced waterfront property with broad, wide views of the main channel. Whether you are looking to have your own arboraceous waterfront getaway home, or own a investment property that is great for short or long term rentals, this is it! In the warm seasons, the dock with covered slip and hoist is ideal for sunbathing, boating and fishing and in the colder weather months stay inside, enjoy the spectacular view and cozy up next to the wood burning fireplace with a book. Furnishings are optional.